If you require Turkish to English translation urgently and for free, this is the page to go to! Input your text in the given box and click on the “Translate” button; it will immediately translate Turkish to English. It’s as simple as that! The computer-aided Turkish to English translator will generate results instantly. However, this is useful only for casual and non-professional translation tasks since this Turkish to English translator is not entirely accurate and only conveys a basic sense of the Turkish text. For professional Turkish to English translation, do contact us for a quote. We will always be happy to offer you professional translation from Turkish to English in excellent quality, yet at nominal costs to you. Turkish is one of the world’s ancient languages, dating back 5500 to 8500 years ago. It is spoken mainly in Turkey and Cyprus and is the official language of these two countries. There are an estimated 80 million speakers of the language worldwide, most of whom are in Western Asia and Southeast Europe. Smaller numbers exist in various countries across the world such as in Greece, Macedonia, Bulgaria, Germany, Canada, Belgium, and Central Asia, besides a few others. The earliest records of Turkic inscriptions date back to as early as 720 to 735 in Mongolia. The first Turkic dictionary came into being in the 11th century. With the advent of Islam, the language was influenced by Persian and Arabic and a new form of Turkish termed the Ottoman Turkish came into being and was used mainly by the literate for administrative purposes. The reforms undertaken by Turkish Language Association after the formation of Republic of Turkey in 1923 attempted to remove all words that had Persian and Arabic origins from the language and reintroduce new words or old Turkic words that had fallen into disuse. The language is still evolving with more words entering its lexicon through English. There are 29 letters (21 consonants and 8 vowels) in the Turkish alphabet that are derived from the Latin alphabet with some vowels modified to suit local pronunciation. 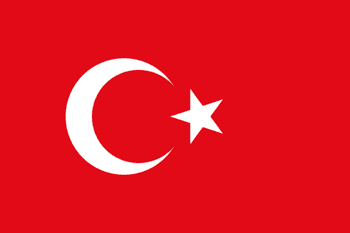 The letters W, X, and Q do not exist in the Turkish alphabet; however, they are used in foreign names and words that have crept in from other languages. It is a phonetic language that retains the pronunciation of the letter. There are no diphthongs in Turkish unless it’s a word adopted from a foreign language.